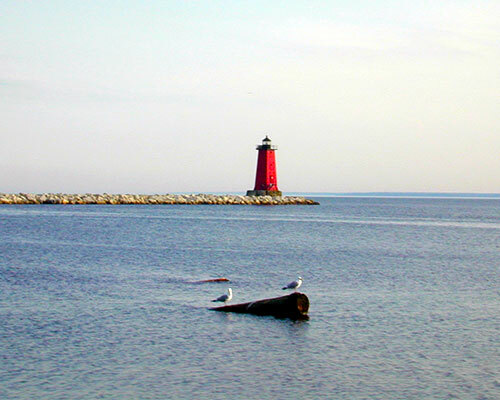 Located in Schoolcraft County on the end of the east breakwater. 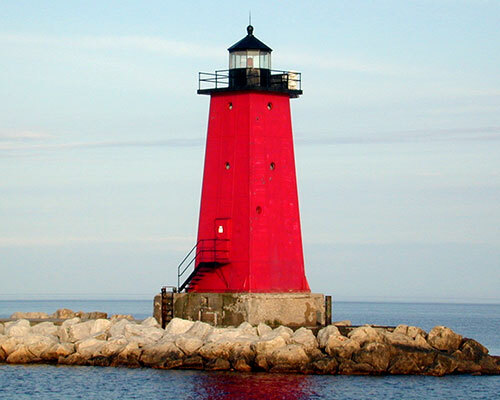 Foundation: Concrete Pier, Construction: Steel, Tower Shape: Square Pyramidal, Markings/Pattern: Red with Black Lantern, Original Lens: Fourth-Order Fresnel (original). 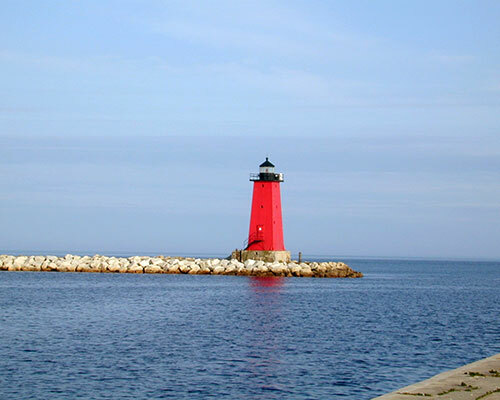 The Manistique Breakwater lighthouse is located in the harbor of Manistique, Michigan. It was listed on the National Register of Historic Places in 2005. 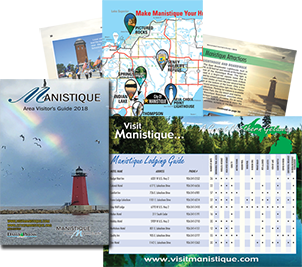 At the beginning of the 20th century, Manistique was a boom town, with timber and pig iron shipping from the harbor daily. However, the harbor itself was protected only be timber crib piers originally constructed in the 1870s. 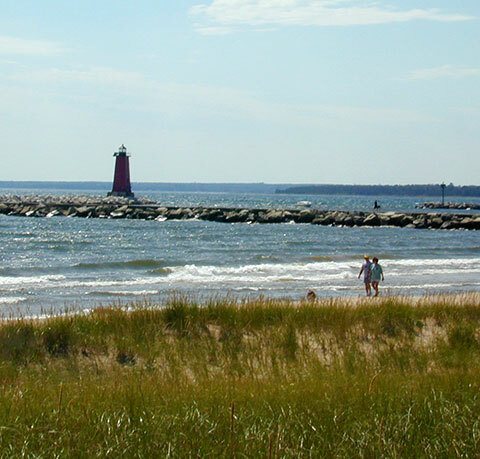 However, by 1910, leaders in Manistique managed to convince the Federal government of the financial importance of the harbor, and an Army Corps of Engineers harbor expert was sent to Manistique to draw up plans for a concrete breakwater structure. The contract to construct the breakwaters was awarded to the Greiling Brothers Company, and construction was started in 1910. At the same time, George Putnam, the newly appointed Commissioner of lighthouses, recommended the erection of lights on the breakwater. 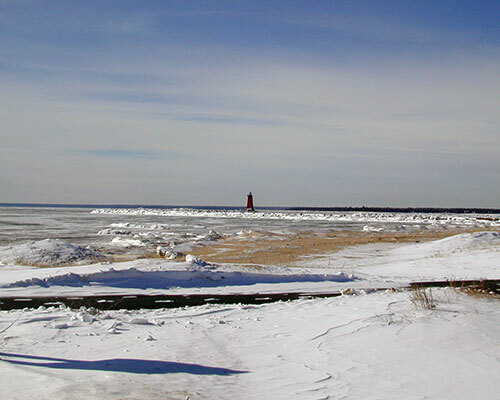 In 1912, the Lighthouse Service erected temporary range lights on one of the piers. Funding for permanent lights was approved in 1913, and by 1914 permanent lights on the west breakwater were complete. The east breakwater itself was not completed until 1915, at which time work began on the east breakwater light and a station keeper's house at the foot of the breakwater. Construction was completed in August, and the new light was lit on August 17, 1916. 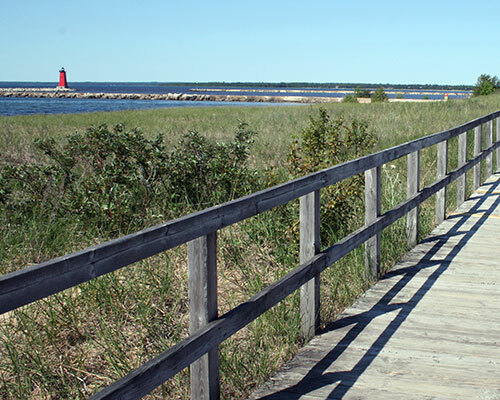 As the century progressed, Manistique's importance as a port waned. The light was automated in 1969, and the original Fourth Order Fresnel lens was replaced with a 12-inch (300 mm) Tidelands Signal acrylic optic. In 2000, the Corps of Engineers replaced the concrete breakwater with rip rap.